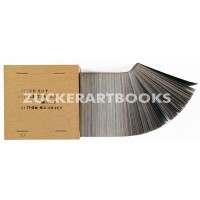 Approx 800 rotaprints in colour, 8,8 x 8,8 x 8,8 cm adhesive binding wooden box. Design and binding by G. Paw and J. Wells Watford. Printed by students of the Watford school of art according to a 'recipe' by d. rot. Published by Edition Hansjorg Mayer Stuttgart. 100 unique pieces numbered. This is the copy number 28. DR. CW. 20 n. 41.. - 997. [ 997].